Kata is possibly the most misunderstood and sidestepped subject in nearly all judo circles within the United States. This is true especially among the competitors and the coaches. Kata conjures up thoughts of anxiety, alarm, dismay and boredom synonymous with jury duty, watching paint dry or for those of us that served in the military, the dreaded KP duty. I will try to dispel this myth in this article, so if you wish to expand your judo knowledge, read on. On the other hand, if you want to persist and continue the alleged fictitious propaganda, you may stop here, read on no further; there’s no amount of encouragement that will alter your views. So what is kata? Simply put, kata is a set of prearranged choreographed judo techniques. What most people perceive kata is performance for demonstrations or “gotta do it for my promotion” thing. But kata is much more than that. Kata is a teaching tool, a learning tool, demonstration tool, tool to maintain tradition and a tool to develop new techniques and ideas. Several years ago, I was asked to speak about kata at the Judo Teachers Conference conducted in San Francisco. I started by asking the group a question, “How many of you practice kata on a regular basis?” Only two hands went up in a room filled to capacity. Then I asked, “How many of you perform Uchikomi on a regular basis?” Every hand in the audience went up. “How about that” I said and continued. “Here’s a thought for you, isn’t Uchikomi a set of prearranged choreographed judo techniques? So therefore, every one of you in this room practices kata on a regular basis”. Let’s move on. Now I’ll lecture, preach, editorialize and summarize the condensed description of kata that I hope will lead to your involvement in kata. Okay, who said “fat chance”? There are many aspects of judo, which can only be fully understood through the practice of kata. It is difficult to fully comprehend judo by just reading books and articles or even watching videos. Getting on the mat and practicing kata is as important as randori practice or competing in a tournament for learning judo. 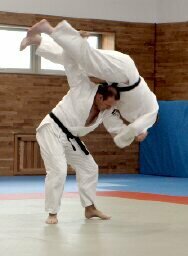 For example, there are historical features of judo, which are retained only within kata. Many such elements involve preservation of unsafe jujitsu techniques, which are prohibited acts in competitive judo today. Most jujitsu classes were conducted as kata classes. The randori practices we do today in judo were rarely carried out due to the dangerous nature of jujitsu techniques. In the days of old, randori and competition resembled advanced ultimate fighting without referees; therefore, most students participating in this type of activity usually ended up in hospitals or showed up at the pearly gates. This was not a good thing for the martial arts schools because lost students meant lost revenues. For Kodokan Judo to become a reality, significant modification and omissions had to be applied to the dangerous techniques of jujitsu. During the formation and early period of Kodokan Judo, Jigoro Kano assembled many martial arts masters of various schools and clans in an attempt to unify jujitsu. The major roadblock to the unification was that most martial arts masters wanted to ensure their secret life-threatening superior techniques were incorporated into judo and not be eliminated from existence. However, Jigoro Kano’s Kodokan Judo philosophy was to create a modern sport with rule and safety features integrated so that it could someday be propagated throughout the world and even become part of the Olympic Games. Jigoro Kano convinced the unyielding masters by offering kata as a means of recognizing and maintaining certain dangerous techniques, thereby preserving their secret techniques and ultimately unifying the many jujitsu clans towards modern judo. Another historical element embodied in kata is the process by which Jigoro Kano developed and refined various throwing techniques. Through the practice of kata, a judo student can learn and understand the development processes of judo techniques. An example of this is the hip throw series in Nage No Kata, the Uki Goshi, Harai Goshi, and Tsurikomi Goshi sequence. Uki Goshi was Jigoro Kano’s favorite throwing technique. He used it often and very effectively. But soon, a few of his opponents as well as some astute students found a flaw. They found that Uki Goshi could easily be avoided simply by jumping around the hip. The solution he formulated to foil this action was to stick out his foot and sweep it across the opponent’s extended leg making them violently tumble onto the mat. Thus Harai Goshi was created. But wait, there’s more! Harai Goshi also had a flaw: you’re balanced on one foot. Any opponent can exploit this flaw by breaking your balance by turning their hip into your hip blocking your sweeping leg. Also this simple action typically broke your grip on their sleeve. Jigoro Kano soon discovered that the opponent’s defensive action to the Harai Goshi can be overturned if he can raise the opponent’s body by pulling up on the back of their collar and simultaneously lowering his body by bending his knees. He found that harder they pushed on his hip, the combination of lifting up on the collar and lowering of the body tended to flip the opponent faster and harder. This technique is now known as Tsurikomi Goshi. As students progress through the kata sequences like this example, they will begin to see and understand progression in the development of the judo techniques. Jigoro Kano in his infinite wisdom wanted to show us that judo is forever changing. Through kata, he is guiding us to recognize and develop new techniques; the answers are there for us to discover. Another important aspect of kata is that it provides an excellent foundation and tools for teachers. Kata enables teachers to instruct students in a variety of throws in a non-threatening environment. This can be advantageous in recruiting and retaining a broad spectrum of participants at the dojo. When you reach a teaching level at a dojo, many students will ask you how the techniques are applied and practiced. Despite numerous years of your training, as a new teacher, you’re only proficient in a handful of techniques and consider two to three of these to teach. Adding to the uncertainty, you likely have developed your own unique favorite way of performing a technique. Most or all the students will have difficulty doing it your way. Furthermore what happens when a beginner requests help for a technique that you don’t know? This is where your knowledge of kata becomes essential in providing you with broad basic knowledge and teaching tools. You will be able to offer expertise in a variety of techniques that can be performed by most students and in a standardized process. Once upon a time, yes it’s time for another story. Actually back in early 1980s, I think it was 1982. I had an opportunity to converse with Yasuhiro Yamashita, the greatest judoka since Masahiko Kimura. At that time, Yamashita had already won multiple World Championships and several All Japan Championships. The only title that had eluded him was the Olympic Gold, which he eventually wins in 1984. As fate will have it, we got onto a subject of kata. To my amazement, he practiced kata on a regular basis. Here’s a man who owns every judo title known to the judo world except the Olympic Gold and he practices kata? WOW! So I asked why? He said that it is one of the ways of ensuring his judo performance is the best possible. Also, when his techniques are not working precisely, he always goes back to practice kata religiously. WOW! By the way, he still practices kata today and can be seen judging at many kata events in Japan. Now that I have your interest captured (you’re bored to death), there’s just a little more to this article, hang in there. So, how about kata for the coaches and competitors? Is it a surprise to anyone that kata can be a positive and necessary collection of weapons in your repertoire? At one of the recent tournaments, one coach felt his player simply fell and should not have resulted in an Ippon call. He was really excited and animated. It was obvious to me that the winner skillfully took advantage of the situation by applying Uki Otoshi at the very moment the loser was about to lose his balance. (Uki Otoshi is the first technique of Nage No Kata.) To the untrained eye it was a slip; for the kata practitioners, it was well timed, well executed throw, Check Mate! … Sorry, IPPON! How about kata for the referees? This is not a conspiracy, just my editorial opinion. If referees studied kata, their eyes for techniques will become more clear and acute making for better accurate decisions. Since the seven official Kodokan Katas are comprised of more than 150 techniques, the referees equipped with a functional understanding should be more qualified to handle difficult calls. Any improvements in the accuracy of referee’s calls should have impact on the path that judo takes in the future. This is a good time for a disclaimer, kata isn’t the answer to everything, but it is a part of the solution. There are many traditionalists who are of the opinion that old original judo techniques are disappearing from today’s competition. Current tournament scoring additions such as the koka and yuko point system may be contributing to the demise of certain key elements of the original techniques. So why koka and yuko? Well, I’m glad you asked. A system of better decision-making had to be developed to address several areas. In the days of Ippon – Wazaari period, many matches ended in a tie which made for unexciting, humdrum contests. Many referees’ tie breaking (hantei) decisions were seen as bad calls or even favoritism. Above all, it was difficult for the audience to get involved and excited during the long 10-minutes or no time limit matches. Can you just imagine watching a judo match on TV and the two combatants shuffle on the mat for 10 minutes with no clear victor? Is this why we don’t have judo on TV in the US? Sponsors? What Sponsors! For judo to continue as a true international sport, dynamic features are needed for adding excitement and audience-centric-ness to the sport. Are all these changes in judo what Jigoro Kano had envisioned? I’m not certain but I believe he wanted judo to be dynamic, eclectic, electrifying and forever evolving. It is clear to me that kata was put in place to maintain the beauty of the old original techniques among the changes that are inevitable and necessary to ensure the future of judo. Many see strategies and tactics slowly replacing the pure skilled technicians of yesterday. But because of kata, I see the new merging with the old, coexisting in harmony. If kata was never incorporated into judo, judo may have transformed into a sport similar to pro wrestling and unrecognizable. Kata is the glue that holds on to the past and is the catalyst for tomorrow. I guess it also keeps the Jujitsu Masters from turning over in their graves. I believe kata is an essential component required for the advancement of judo. It’s judo history 101. Jujitsu Masters demanded inclusion otherwise judo may not have existed today. The early contest rules for judo dictated superior skills in a wide variety of wazas. I see the modern judo also demanding superior skills in a wide variety of wazas but with additional rules, strategies and tactics that influence broad range and continuum for the competitors and elevated excitement for the spectators. If judo in the US can more widely adopt kata as one of the ways to develop effective techniques, kata will ensure the unique identity of judo be maintained for the followers of judo, today and tomorrow. Like many things placed within the historical framework, kata has come full circle in its role to reveal and advance our understanding of judo. You know, maybe, … and just maybe, a good solid basic foundation of kata knowledge may hold the key to your success. It couldn’t hurt. It seems it helped Yamashita. If it’s good enough for him, it otta be good for you too. WAKE UP! I’m done with this story… So, are you ready to take on this challenge now? “Are ya ready for some kata?” I dare ya! Note: This article was published in California Judo Magazine (May 2005) and is reprinted with permission of the author. Kenji Osugi is a rokudan and senior instructor at Sawtelle Dojo in Los Angeles.